Health Minister, Dr. Christopher Tufton, has listed the ambitious date of November 2018 for the completion of the mammoth rehabilitation and restoration project now underway at the Cornwall Regional Hospital in Montego Bay. Minister Tufton made the announcement as he addressed a press conference on Friday following a tour of works at the multi-disciplinary facility. He said while the scope of work is great, he was confident that the deadline would be met. “So far, it has been designed. We have gone to tender to select a manufacturer of the system. They then have to build the system as it is not a shelf item and that will take a number of months and will also take some time to install,” he said. 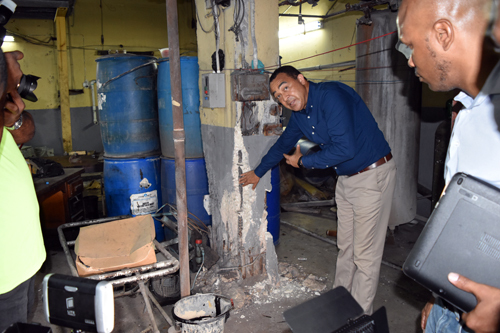 Minister Tufton further explained that the ventilation system (HVAC) is the costliest component of project, with a price tag raging between 500 and 600 million dollars. Quizzed about the government’s ability to fund the project, which now has a price tag of approximately 2 billion dollars, the Health Minister said the financing will have to be found. “The preliminary estimate says 2 billion dollars and yes, we will have the resources to get it done. We cannot fail to do what is being done. It is a matter of how you prioritize and reallocate resources. As of now, I have had no difficulty in terms of resources required, we have to account for what we spend, so the resources won’t be an obstacle,” Minister Tufton explained. He advised that the boilers have been relocated from the basement to an area adjacent to the laundry and are to be re-commissioned, while a new building housing them is just about 30 percent complete. “When we removed the boilers. we discovered that there were some cracks in the wall with exposed steel, and this was made worse by the recent tremor on February 5. What we have done is to call in the National Works Agency engineers who did a preliminary examination and advised that we needed to do some more work to reinforce the base, again creating another scope of work, but that is now being done,” the Health Minister explained. In the meantime, the eighth, ninth and tenth floors and the operating theatre on the fifth floor of the hospital have been stripped of all equipment, and windows and sections of the walls have been dug out and prepared for rehabilitative works to be undertaken. The 139 patients have all been relocated to the staff quadrants, which are now being expanded to accommodate 36 additional beds for relocation of other patients. In addition, the Medical Records ward at the Falmouth General Hospital will be converted to an additional medicine ward for 24 patients from Cornwall Regional Hospital and the surgical ward there, as well as the post operating area, will house 42 surgical patients as of March 19. The Cornwall Regional Hospital has been battling resurgent air quality issues, fuelled by a malfunctioning ventilation system which was said to be contaminated by mould, with several health workers complaining of health issues related to the system.